Michael F. Holt, the author of Political Parties and American Political Development from the Age of Jackson to the Age of Lincoln, is recognized as one of the most prominent political historians for America in the nineteenth century. The center of Holt’s historical work is a theme of answering how and why the United States went to war amongst themselves in what became the bloodiest war in American history, the Civil War, by emphasizing the role that politics played in shaping this trajectory. His prominence transpired in the late twentieth century in a period characterized by the New Political History framework. The historians that advanced this notion discredited the former perspective that political development was impacted solely from the national level, or in other words, that national political figures in Washington were the crucial participants that drove the United States to the point of sectional fracture and conflict. In doing so, there was a rise in significance for grass-root movements and voter analysis that advocated the necessity for a shift to placing the center of development on the state and local politics or issues. Holt published essays and gave prominent guest lectures that defended and advanced these very tenets to viewing American Political Development, but in 1992 he organized a collection of primarily old, and one new, essays that challenge this innovative form of political history that he once helped create. 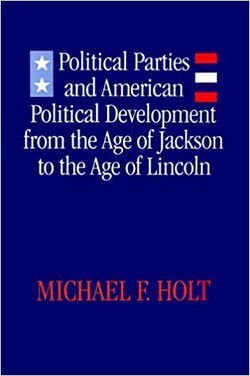 Michael F. Holt’s Political Parties and American Political Development from the Age of Jackson to the Age of Lincoln collected essays that ranged from covering the Antimason and Know Nothing parties to detailing the rise of the Democratic party until the beginning of the Civil War to questioning why the Whig party, and the second party system, fell during the mid 1850s. With more topics covered in the book, Holt uses a diverse range of essays that span a twenty year period from 1970 to 1990 to give the reader a widespread account of both how his research has developed and refined through this period, but, more importantly, how his ideas of political development have transformed into something that now contests his former work. By opening the book with a 32-page introductory section, Holt is able to document his own thoughts of how his views have developed, how each of the previously published or presented essays could be edited in terms of his new views or new publications that create a more accurate version of the account, and how each ultimately fits within the larger theme of American Political Development. In this introductory portion, Holt notes that the shift to the locality is vital to understanding political development, but he argues that these various facts alone do not translate to our understanding of the larger political issues or events that transpired. By viewing these same issues within a political structure that was defined by the competition instilled through the two-party system, historians and political scientists would be able to view each event, whether national or local, as vital to the overall development of the country to the point of the Civil War. He also notes that this same argument for political development and use of voting statistics will be seen in his larger work that would be published seven years later, The Rise and Fall of the American Whig Party, which actually creates a better argument for this theory in what became an account that is not quite triple the length of the average historical work. The theory that Holt advocates can only be accepted through the extensive use of voter analysis for the nineteenth century that was formed amongst the New Political Historians. By translating these practices to his new theory, Holt argues that voting became a tool as suffrage expanded throughout this period. In a political structure that was centered on the role of differences between parties, voting became a tool for constituents to proclaim their support for, or frustrations with, policies of the incumbent party, or party that primarily held power. In this view, there is a reciprocal affect between local and state issues creating voting patterns that then result in certain reactions by the parties to attempt to resolve the issues. As each party proclaims their stance, and the more different it is from the other party, the more voters they would be able to excite to get to the polls. Thus, parties would be able to use these local, state, and gubernatorial elections to view their success at advocating for such policies that reacted to local and state issues, but more importantly, and it can be seen for the Whigs after both presidential victories in 1840 and 1848, the crucial aspect of a timely transition to an enactment of those policies as well. Holt’s development makes election outcomes significant to how parties reacted and continued to advocate for certain platforms. There is a special place for Holt’s own work on third parties during this period due to it placing further significance on the two primary powers in the two-party system to continuously advocate for responses, policies, and ideologies that all counter the other party. This role is most prominently seen as why the Whig party was able to rise during the 1830s amongst other competitive parties against the founded Jacksonian Democratic machine. The Whigs formed not just because of the economic ideologies of Henry Clay and John Quincy Adams, but as a response to viewing the Whigs as the best party option that could counter the Democrats. Although Antimasons continued to play a role in certain states, most of them transferred to the Whig party as it continued to accept ideologies that aligned with various factional groups with different agendas. Similarly, the reason Whigs became known as an aristocratic party was due to the merchants and urban wealthy voters from the northeast expressing their frustration with the anti-banking platform that President Andrew Jackson advocated for, and, thus, responded by exiting the party for the best party that differentiated on economic policy. Where differences were unable to represent the local issues or where frustrations with both major parties and politicians became a driving factor, the tool of voting was used to form third parties that were usually tailored for the specific grievances that were held at the time. The fall of the Whig party is a central theme for Holt’s overall research, as I mentioned his lengthy work that encapsulates the arguments made throughout this current piece. By using his third party view, he argues that the formation of the Know Nothing party as a better anti-Democratic party during the mid 1850s was more influential to the fall of the party than was the rise of the Republicans at the time (116). Due to continued miscalculations of nominating presidential candidates on the premise that advocating Whig economic and responsive programs would not obtain the presidency, in response to state and local elections during 1839 and 1847, the party failed to place staunch party program men as the leaders when only months after both nominating conventions were held the nation slid into economic depression. In both occurrences, the Whigs failed to understand the very political structure that they were in, one in which party values were vital to winning elections. By pandering to the lowest denominator by nominating two military heroes with completely different backgrounds and term actions, both would ultimately end with the same result: the strained effort by the Whigs to regain voter faith and support in the following state and local elections. The primary issue after the debacle of Zachary Taylor’s nomination and election to the presidency was the conclusion of the Compromise of 1850. This may have kept the country from a Civil War ten years earlier, but it led to an inability for Whigs to advocate difference, or opposite sectional policies, due to the bi-partisan support the Compromise necessitated to pass Congress. As Whig voters were frustrated with a lack of policy follow through, an inability to see difference between both major parties, and an influx of immigrants during the past decade that was now resulting in current mass naturalizations that were not being contested by the party there became a rise in abstentions on the one hand, and defections to the Know Nothing party that directly formed to counter these pressing issues on the other. By the Election of 1856, most of the northern Know Nothings saw the Republicans as the best anti-Democratic and anti-Southern party that encompassed the same anti-Catholic and nativist ideology they joined the former party for, but now they can also contest the events of Bleeding Kansas and the caning of Charles Sumner. With a lack of voters the Whig party finally came to its demise by the end of the 1850s due to its inability to be the best secondary option for constituents. The theory of American Political Development that Holt argues is one that counters most previous constructions of the topic. Holt contends that political development cannot be viewed within predetermined timeframes, but must encompass each event or voter reaction as it transpires to understand why a catastrophic event like the Civil War occurred. The merging of emphasis on all levels of the two-party system allows Holt to engage development in an innovative way, especially when placed in the context that he was so influential to forming a former conception that solely viewed grass-root movements and voters. Though there are contesting theories to the current day about how to view development, Holt creates an incorporative viewpoint that uniquely allows for a new interpretation of how third parties and the Whigs rose and fell, how the Democrats formed and transformed, and why the United States took a path toward secession and violent conflict by 1861. Though this theory works for the nineteenth century, it lacks the ability to be used in a longitudinal political study through the twentieth century. Although the book is a collection of different essays, aligned from date of conception and not chronology of content, Holt does a wonderful job in creating an easily read narrative for American political history and its development from 1820 to 1860.